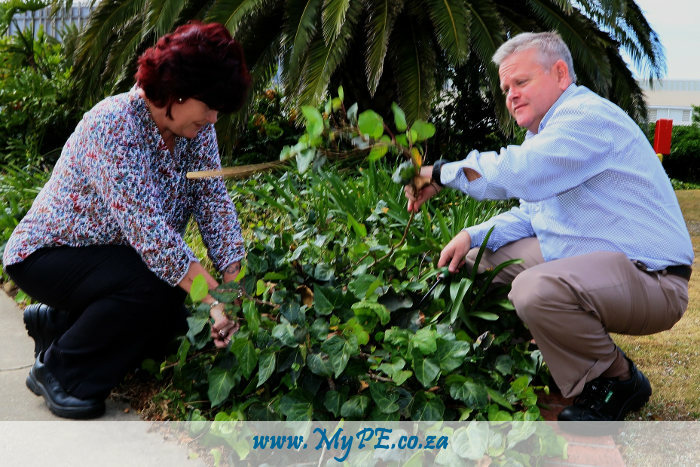 Huldah Solomon, (left) GMSA Environmental Engineer and Clayton Whitaker, Vice President of GM Africa Manufacturing, take a closer look at the indigenous vegetation on the premises of the Struandale Manufacturing Plant. Port Elizabeth – General Motors South Africa’s (GMSA) Struandale plant has received its conservation certification for Invasive Species Control from the Wildlife Habitat Council (WHC). The WHC Conservation Certification program provides a structure for cooperative efforts among management, employees and community members to create, conserve, and restore wildlife habitats on corporate lands. The Struandale plant earned its certification for its efforts in establishing its own framework for Invasive Species Control. This means that indigenous vegetation is conserved while alien vegetation invasion is restricted. According to Ncedisa Mzuzu, Environmental Group Manager, for GM Africa, there was no framework for species monitoring, control and eradication. The GMSA team had to establish its own framework and as part of its Environmental Management System ensures appropriate monitoring and control on-site. Mzuzu said the environment is a key strategic imperative for GMSA – striving to minimise and mitigate the impact of operations on the natural environment and the communities within which the company functions. “Annually the whole site is surveyed to ensure that all species on site are identified. And if there are invasive vegetation present, action plans are put in place to remove these species,” Mzuzu explained. She said Struandale is at high risk for the spread of alien species due to its location. “The wind propagates the spread of invasive species, especially during seed dispersal periods,” she said. The Struandale plant is one of 62 sites across General Motors Company’s global facilities, to achieve conservation certification from the Wildlife Habitat Council. Mzuzu said sustainable development and protecting and promoting biodiversity is high on the company’s agenda. Wildlife Habitat Council promotes and certifies habitat conservation and management on corporate lands through partnerships and education. Its Conservation Certification programs take corporate sustainability goals and objectives and translate them into tangible and measurable on-the-ground actions. Mzuzu said regular audits will be done by the organisation to ensure that GMSA complies by the certification regulations. She added that progress is also being made at the company’s other facilities for conservation certification. Late last year GMSA’s Parts Distribution Centre, situated in the Coega Industrial Development Zone (IDZ), started a landscaping project which is aimed at rehabilitating non-vegetated land within the site by using indigenous and endangered plants from the IDZ nursery programme. GMSA is the first tenant in the IDZ to make beneficial use of this nursery.